Yesterday started with a bang and I realized it was Wednesday and not just any other Wednesday but a Blog Hop Wednesday. Usually, I compose the blog hop post well in advance, but today I was almost caught off guard. Really, for no reason I can fathom, I suddenly realized that I have not been keeping a track of what day it is? Even after I had scheduled this post for Tuesday! Well the forgetfulness episodes is not just about this but about all the other 101 things I keep forgetting everyday and particularly those things DH categorically asks me to do. First thing first. So, when I realized it was blog hop Wednesday, I headed off to my assigned blog (which I have visited a couple of time the past week and have read almost all her posts). But, now I was looking for something that can be prepared in a jiffy. I had already bookmarked this, this and this. Then I had thought of this, but then I didn't have the said biscuit at home. So, finally I zeroed on this recipe as it was the quickest thing possible. I whipped it up, clicked a few pics, kept the dip in the fridge and headed straight to the already appointed engagements of the day. I came back home a little late than planned and was literally starving. 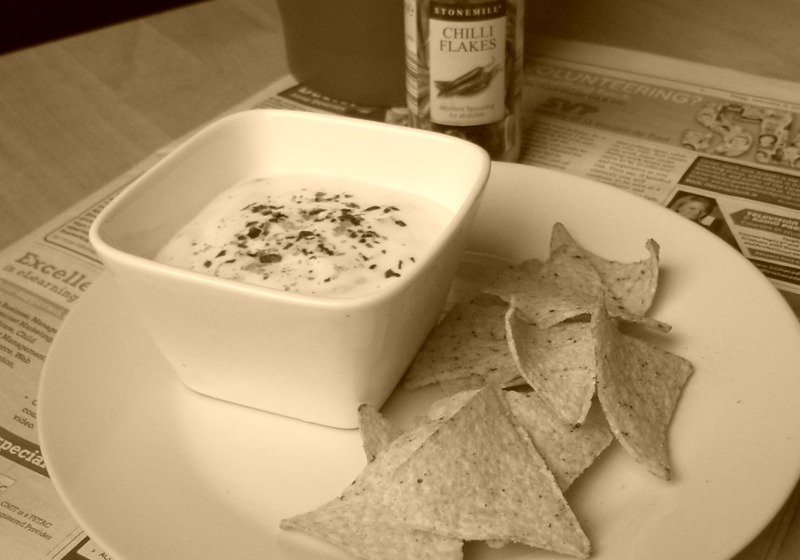 This dip and the tortilla chips came to my rescue and in no time, I finished off the bowl clean. Note: I have used Greek Yogurt here which is thick and creamy. Instead, you can use hung curd, prepared by spreading the yogurt over muslin cloth lined over a sieve and letting the whey from the yogurt drain away. Add everything in bowl and mix well. The dip is ready to serve. I had it with lightly salted Tortilla Chips. As Pinky puts it, It is a very versatile dip and can be used to spread it on sandwich and I am going to try that soon. Do check what other blog hoppers are up with. I will chronicle my forgetfulness episodes in the next post as it I have ranted a lot here already. Thank you for stopping by! Cheers! easy and nice recipe!lovely pics!